Chris Grabenstein's "Escape from Mr. Lemocello's Library" is the 2014-2015 winner of the Dorothy Canfield Fisher Children's Book Award. 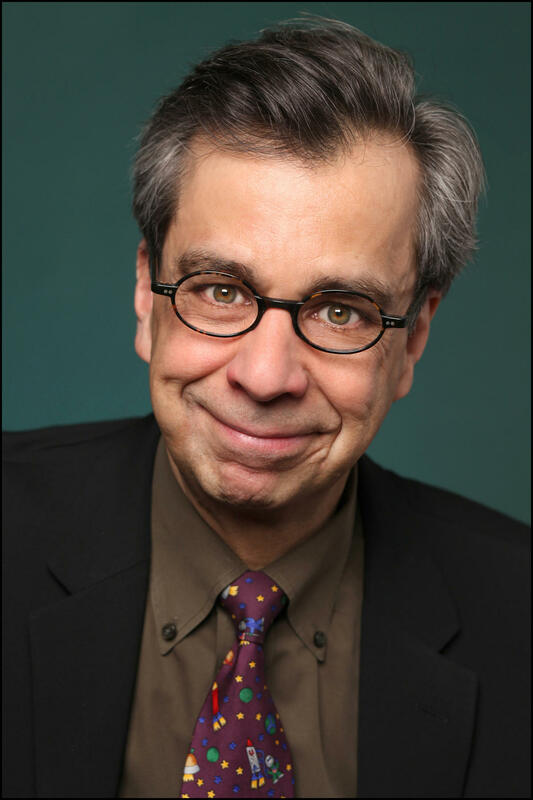 The educators at the Dorothy Canfield Fisher conference were more surprised to learn that Chris Grabenstein will be coming to Vermont on Saturday, June 13 to accept his award. Escape from Mr. Lemoncello’s Library is about a group of 12-year-olds who are locked inside a brand new state-of-the-art library, with features like a holographic librarian and shelf-stocking robots. The library was built by a master game-maker, Mr. Lemoncello. And the kids are competing to be the first to find their way out, using only the tools found within the library. Kids who voted for the book say they liked solving puzzles in the story, alongside the characters. Dorothy's List spoke with New York City-based author Chris Grabenstein, who says he’s excited to come to accept the award in person. "I really want to thank the kids who voted for the book more than anything," says author Chris Grabenstein. Chris Grabenstein: I really want to thank the kids who voted for the book more than anything. Winning this kind of award – because there’s all sorts of awards that are given out by librarians and organizations – but when a bunch of kids sit down and read a list of books and say, "This is our favorite." That is, for me, that’s really who I’m writing for so that means more than anything in the world. So thank you, Vermont. I’m going to buy you all some ice cream. We’re going to go to Ben & Jerry’s and convince them to make Lemoncello Lemonhead ice cream, or sorbet. While there may not be a Lemoncello ice cream yet, author Chris Grabenstein says there might be a movie in the works. Chris Grabenstein: Well there’s a chance that Nickelodeon might turn it into a movie. We don’t know for sure. So that’s pretty exciting. Chris Grabenstein says he recently finished writing a sequel to Escape from Mr. Lemoncello’s Library. Chris Grabenstein: And it comes out, I realized on 1-6-1-6, January 6th, 2016. And it will be called Mr. Lemoncello’s Library Olympics. … There’s going to be regional competitions and then six teams will come to Ohio for the first ever Library Olympics, to be held on March 20, because the other Olympics already have the winter and summer, so Mr. Lemoncello will do spring. Even before Escape From Mr. Lemoncello’s Library was announced as the 2015 winner, the Dorothy Canfield Fisher award committee had released the list of 30 books nominated for the 2016 award. Youth services consultant Sharon Colvin is one of eight members of that volunteer committee. Dorothy’s List sat down with Sharon and committee chairperson Hannah Peacock, who’s also the children’s librarian at Burnham Memorial Library in Colchester. We asked them to tell us about some of their favorite titles on the new list. Sharon Colvin's first pick was The Scandalous Sisterhood of Prickwillow Place by Julie Berry. 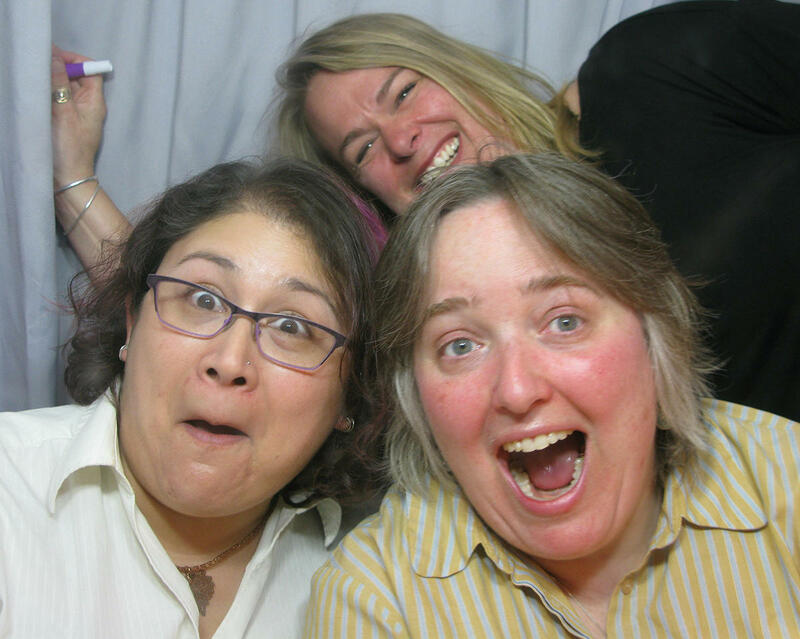 Dorothy's List Curator Amy Noyes photobombs Sharon Colvin and Hannah Peackock's photo booth session. Sharon Colvin: It’s hilarious. So funny. So this is a dark, dark comedy. And it’s about these girls who are in a boarding school, a finishing school in the 1800s, in England, and they have this kind of Miss Hannigan-esque headmistress who’s not nice. And one day they’re having Sunday dinner with the headmistress and the headmistress’ brother and they mysteriously drop dead. And so the girls have to figure out what to do and they’re thinking, “Oh my gosh we’re going to get in trouble. And they’re going to send us home.” And they don’t want to go home and, “Ooh, if we just ignore it, maybe they’ll just let us do whatever we want!” And of course that sounds appealing, so they burry them in the back yard, which is horrifying yet hilarious. And then they pretend – they make one of the girls dress up like the headmistress – and they pretend like nothing ever happened. But, of course, that is not going to last very long. And while they’re trying to pretend that the headmistress is still alive, they’re trying to unravel the mystery of who killed them and trying to protect themselves because they don’t want to get blamed. Hannah Peacock gave her first nod to a book called The Misadventures of the Family Fletcher by author Dana Alison Levy. Hannah Peacock: It’s a book about two dads who have adopted four boys. And it’s not about the dads being gay that’s important in this book. It’s just about them being a family and finding their place. Nothing crazy happens. It’s a sweet, gentle book about boys growing up and dads finding how to parent. And there’s no huge thing in town like, “Oh my god these two dads…” No one cares. It’s just about a six year old, two ten year olds and a twelve year old going to different schools and one of them going to school for the first time. And all finding different interests and breaking out of their shells. It’s just the sweetest, loveliest book about kids. Sharon Colvin also selected a quiet book for her next pick, The Turtle of Oman by author Naomi Shihab Nye. The title refers to time that the boy and his grandfather spend watching sea turtles, as the animals return to the shores where they born. Sharon Colvin: This book just blew me away. It’s short. It’s almost like poetry; it’s written so beautifully. And it’s about a boy who, he lives in Oman and he’s going to be moving to the United States and he really does not want to go. And the whole book kind of reads as this love letter to Oman. He just loves his home so much, and his family, and he spends time with his grandfather, kind of saying goodbye. And he knows he’s going to return, which is why it’s called The Turtle of Oman. He knows he’s going to return like the turtle in a few years. But it just breaks his heart to leave. So it’s the story of this little boy, who’s kind of dragging his feet ... But at the same time he’s really immersing himself in his family and his home … Not a lot happens in this book but it doesn’t matter. It’s just a sweet, gentle read. I hope a lot of kids pick it up. Greenglass House by author Kate Milford is Hannah Peacock’s next selection. Hannah Peacock: And it’s a book that’ll be so interesting to so many different types of readers. Because there’s mystery, there’s imagination, there’s friendship, there’s adoption… So it’s the story of this couple who run this inn up on the hill in Nagspeake. They have an adopted son and he’s so excited because he thinks he’s going to get to spend Christmas doing nothing. And then all of a sudden, all these guests show up. And they’re all coming for different, connected reasons. And he ends up having to solve they mystery of why everyone’s there and what it’s all about. And the inn, historically it’s a place where smugglers came through. And so some of that connects back. And then he has this new friend, that you’ll find out a lot about. And they end up solving this mystery together. But there’s all kinds of little nuisances and little mysteries and little games and puzzles to solve. And it’s just one of my favorite books on the list as well. And Hannah Peacock has a bird-themed supernatural book in her top three: Gabriel Finely and the Raven’s Riddle by George Hagan. Hannah Peacock: Again, it’s a mystery. So this boy’s about to turn 12, he lives with his aunt and his father has gone missing. There’s a connection to him turning 12 and certain things happening. And he and his dad both have this connection with ravens, where they can actually sort of meld their bodies with them and fly … Anyway, so he and these new friends he and his friends decide they’re going to find his dad or look for his dad and his uncle, who’s turned a little mad. And they go to this underground world called Aviopolis that’s run by birds. And all throughout there’s puzzles and games and there’s ravens and there’s valravens. And the valravens are bad. So ravens always identify each other by having to solve a pun … If they laugh then they’re a raven and if they don’t get it then they’re a valraven. So there are puns throughout the book, which is just awesome. And again, it’s a story about friendship and adventure and there’s puzzles and it’s fantasy and it’s a good mystery. Sharon Colvin’s third pick is a graphic novel called El Deafo by author and illustrator Cece Bell. Sharon Colvin: I will tell you, I’m not a huge graphic novel fan but this one blew me away. It’s fantastic. It’s really approachable. It’s a memoir. It’s about a girl who, in the 1980s, had a hearing problem and so she wore this really conspicuous, bulky hearing aid that was obvious to all her classmates. And, of course, it came with the accompanying bullying and feeling like an outcast. And the art is fantastic because the characters are not human, they’re bunnies. Which I just love. I don’t know there’s something endearing about that. And what happens is she turns that into a superpower. And she calls herself El Deafo, and so she becomes a superhero who has this special power … and I think this story’s really relatable. I think that every kid’s going to understand how it feels to feel left out, feel different, and to get kind of that negative attention. But the great thing about this character is she turns it around and she becomes a hero of her own story, which I just love. And because it’s a graphic novel I think it’s going to reach a lot of readers who wouldn’t necessarily pick up a big, wordy prose novel. Those are just a few of the 30 books nominated for next year’s Dorothy Canfield Fisher Award for middle grade readers. Want more? Find the entire DCF Master List here. It’s a great way to start your summer reading! Dorothy’s List is sponsored by the VPR Journalism Fund. This month Dorothy's List visited the West Rutland School, where sixth graders have been reading a Golden Boy by Tara Sullivan. Golden Boy tells the story of an albino Tanzanian boy named Habo. Habo is forced to flee across his country, when a poacher tries to hunt him down. It's a difficult read that’s hard to categorize. It reads like historical fiction, but the real-life circumstances are both modern-day and horrifying. For New Hampshire sixth grader Ruby Pepperdine, the "center of everything" is up on the rooftop of Pepperdine Motors, stargazing with her grandmother, Gigi. In Vermont author Linda Urban's book The Center of Everything, after Gigi dies, Ruby has one big regret. She didn't listen to the last thing her grandmother tried to tell her.